Tunisian Crochet Blanket Pattern ... Customize to Any Size! 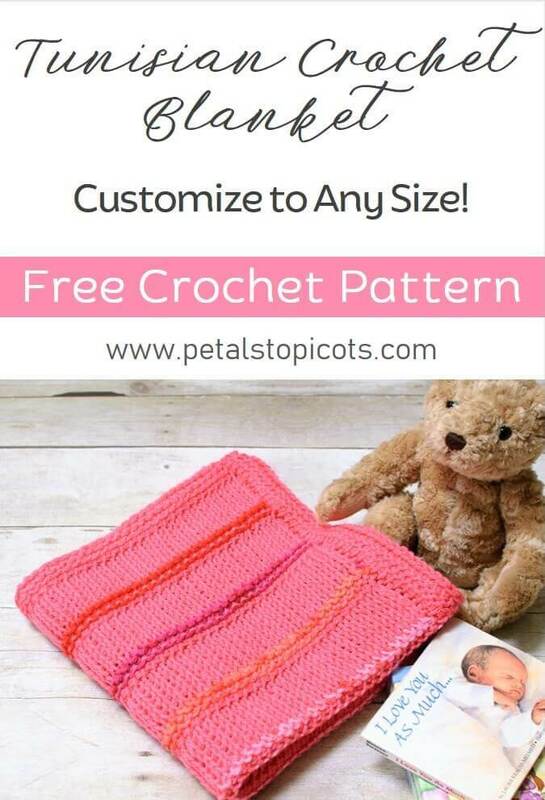 Home > Crochet > Tunisian Crochet > Tunisian Crochet Blanket Pattern … Customize to Any Size! 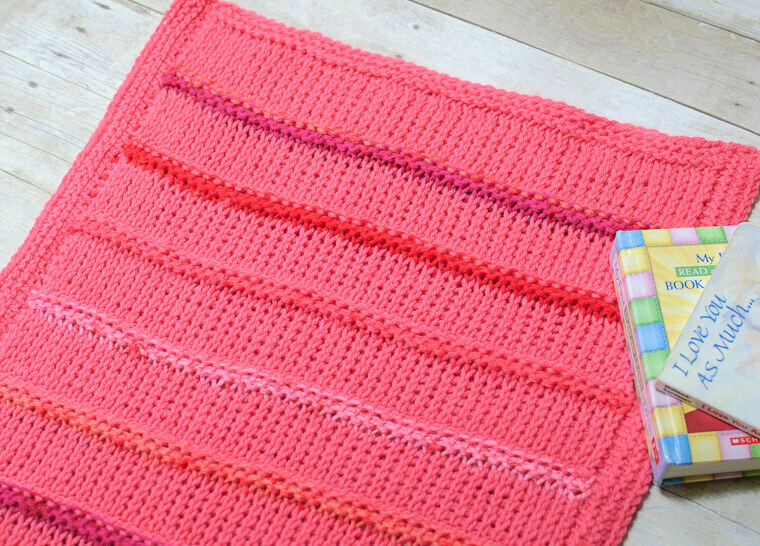 It’s always good to have a basic pattern in your library that’s easy to customize to any occasion and this Tunisian crochet blanket pattern fits the bill! You can customize it for newborns up to any size desired and switch up the colors to suit any theme or decor! 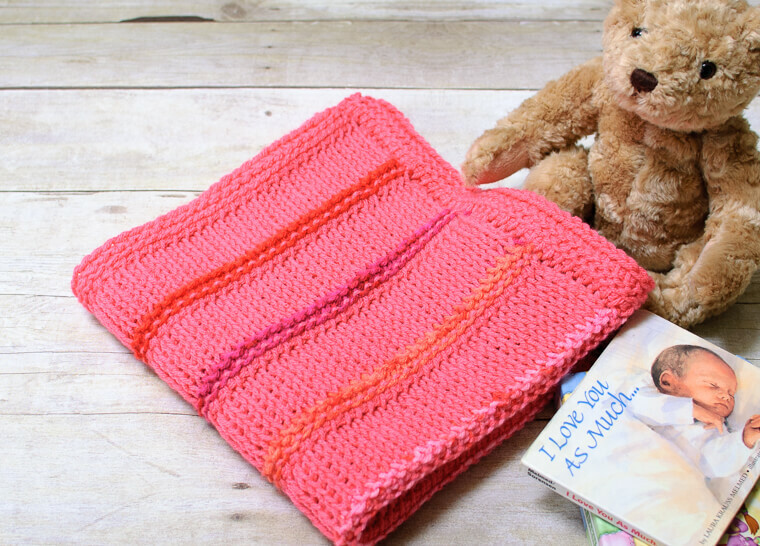 As written, this Tunisian crochet blanket makes a great gift for a new mom and is the perfect size to use for homecoming or over a carrier or car seat. Want something larger? No problem, just chain until you are 2 inches less than your desired width then follow the pattern as written. Just be mindful that you may need more yarn if making your blanket much larger than written here. Finished size as written measures 20 in. x 24 in. but can be customized to any size desired. When working your forward pass, the loop on your hook counts as the first stitch. With the larger hook and CA, chain 46 (or any number to obtain size desired). Foundation Row: Beginning in second ch from hook pick up a loop in each chain across – 46 sts. Rows 1 and 2: Tps across – 46 sts. Rows 3 through 9: Tks across – 46 sts. Rows 10 and 11: With CB, Tps across – 46 sts. Rows 12 through 18: With CA, Tks across – 46 sts. Repeat Rows 10 through 18 six more times or until you are within 1 in. from your desired length. Rows 73 and 74: With CA, Tps across – 46 sts. Bind off in Tss. Fasten off, weave in ends. With the right side of the blanket facing up, add an edging along each side to match the top and bottom edging already worked. With the smaller hook and CA, pull up a loop at the end of each row up side, work a basic return pass. Rows 1 and 2: Tps across.